Cheers' is the universal toast - offered around the world by royalty and commoner alike! 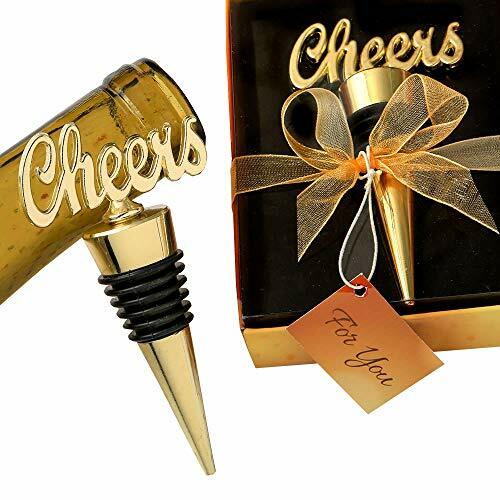 Bring Cheers to your unique event with these stunning bottle stoppers. This bottle stopper is made from all metal with a gold plated finish. The top features the word 'CHEERS' spelled out as a cast gold metal charm. The bottom of the gold metal stopper has a black rubber gasket for a tight seal. This upmarket stopper comes in a Bokeh design bottom box with a black interior stage and a clear display top. The box is wrapped with an ecru color organza ribbon and bow. Attached to the ribbon is a matching Bokeh design 'For you' tag. The perfect favor for any classy occasion offering the universal toast of 'Cheers'.